But wait, what about the World Wars? What about Vietnam? Surely those wars, which claimed the lives of over 500,000 American soldiers, were just wars and couldn't be based on lies, right? Wrong. On August 4, 1964, President Johnson claimed American ships were twice attacked by North Vietnamese forced in the Tonkin Gulf. In response, LBJ escalated air strikes against North Vietnam, and issued the Gulf Of Tonkin Resolution on Aug. 7. This resolution gave the president the authority "to take all necessary measures to repel any armed attack against the forces of the United States and to prevent further aggression." So began the Vietnam War. Sounds somewhat justified, right? That is, until you find out that there was no attack on U.S. ships on August 4, 1964. The commander of the task force in the gulf, Capt. John Herrick, blamed "freak weather effects," "almost total darkness" and an "overeager sonarman" who "was hearing ship's own propeller beat." Basically, jumpy soldiers thought they were being attacked when they weren't. 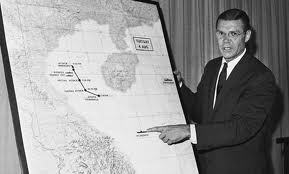 Oh, and the "task force" in the gulf that LBJ claimed was on "routine patrol" was actually on an aggressive intelligence-gathering mission, even coordinating attacks on North Vietnam with Laotian and South Vietnamese forces. In fact, just two days before, there were two attacks on North Vietnamese bases. Navy pilot (flying right over the ships that night) and future VP candidate for Ross Perot, James Stockdale, reported: "I had the best seat in the house to watch that event, and our destroyers were just shooting at phantom targets — there were no PT boats there.... There was nothing there but black water and American fire power." Even the man who went on national TV and lied directly to the American people, Lyndon Johnson, commented in 1965: "For all I know, our Navy was shooting at whales out there." Almost 60,000 American soldiers died in the Vietnam War. God bless America. On December 7, 1941, about 3,000 U.S. servicemen were killed by a surprise attack by the Japanese at Pearl Harbor, Hawaii. The attack came without any notice or leaked information from the Japanese, and President Franklin Roosevelt succumbed to public pressure was reluctantly forced into World War 2. FDR not only knew the Japanese attack was coming, but he also provoked it and let it happen so the U.S. had an excuse to officially enter WW2 (it was already providing money and equipment to Britain, France, and Russia). On October 7, 1940, one of Roosevelt's military advisors, Lieutenant Commander Arthur McCollum, wrote a memo detailing an 8-step plan that would provoke Japan into attacking the United States. Among the provocations was the total blockade of Japanese oil imports agreed upon by the US, Britain, and the Dutch. FDR also started an all-out embargo of Japan, and forbade them the use of the Panama canal, which eliminated the Japanese ability to get much-needed oil from South American countries like Venezuela. Another provocation was that the United States authorized an all-volunteer air-group called the Flying Tigers to fight the Japanese in China. Even before Pearl Harbor, these squadrons had already shot down over 100 Japanese fighters above China. Before the "surprise" attack and unbeknownst to the Japanese, the United States had already broken the encryption codes used by the Japanese military. The US could automatically decrypt any coded Japanese military or political messages almost as soon as they were transmitted. With this decryption, the US was even able to keep tabs on not only Japan's military communications, but also Japan's internal politics and squabbles. "The task force, keeping its movement strictly secret and maintaining close guard against submarines and aircraft, shall advance into Hawaiian waters, and upon the very opening of hostilities shall attack the main force of the United States fleet and deal it a mortal blow. The first air raid is planned for the dawn of x-day. Exact date to be given by later order." On January 27, 1941, Joseph C. Grew, the U.S. ambassador to Japan, wired Washington that he'd learned of the surprise attack Japan was preparing for Pearl Harbour. 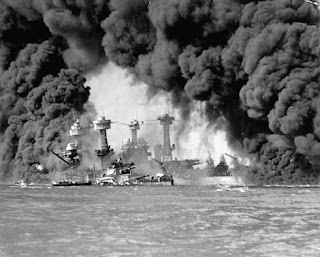 The night before the attack, President Roosevelt, members of his cabinet, and top military leaders already had all the necessary information on the Japanese attack, such as the when and the where, but did not inform the commanders at Pearl Harbor. Even US Admiral James Richardson objected to FDR's insistance that the fleet be docked in the strategically-vulnerable bottleneck of Pearl Harbor, where no escape could be made in the event of an attack. For his keen insight and service, Admiral Richardson was promptly fired by FDR. Secretary of War Henry Stimson recorded a meeting of FDR's top advisors in his diary in November, 1941: "The question was how we should maneuver them [the Japanese] into … firing the first shot without allowing too much danger to ourselves." The attack led to the destruction of several US ships, but all of the ships left in the harbor by that point were out-of-date, WW1-era ships, and none were aircraft carriers. FDR, knowing that his aircraft carriers were the most important pieces to a war with Japan, moved the Enterprise and the Lexington out to sea, and the Saratoga to San Diego not long before the attacks. A day that will live in infamy, indeed. On May 7, 1915, during World War 1, almost 1,200 people were killed when the British passenger ship RMS Lusitania was torpedoed and sunk by a German submarine off the coast of Ireland. 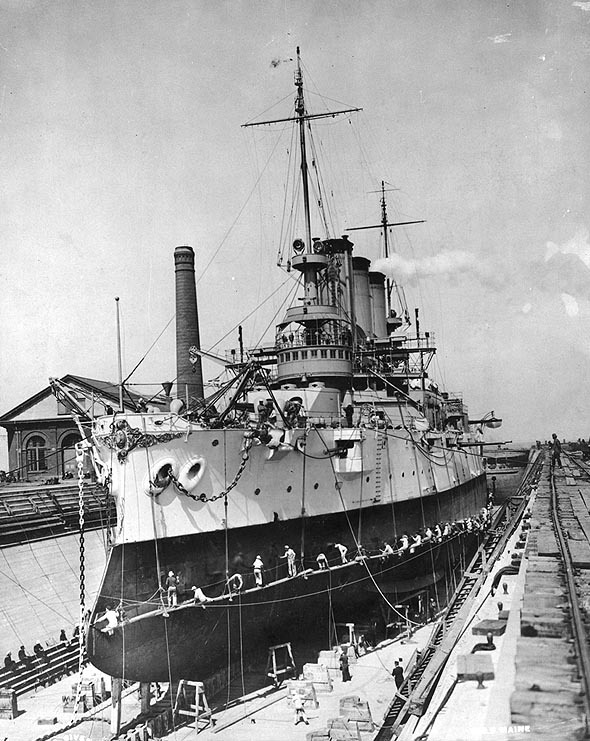 While Germany insisted that the ship, the fastest cruise-liner in the Atlantic, was carrying munitions and supplies for the Allied powers, it was maintained by the Allies that the Lusitania was unarmed and therefore the attack was unprovoked. The attack resulted in widespread support for the United States' entry into WW1. Unrestricted submarine warfare was a touchy subject in WW1. The Germans, trying to blockade Britain and "starve" the country out of the war, warned us that there was... eh, kind of a war going on, y'know? And that any ships en-route to Europe could be searched, seized, or attacked as under suspicion of supplying the British. Eventually, Germany relented to pressure from the US to stop unrestricted submarine warfare in the Atlantic ocean, but quickly resumed the practice in the areas around the English Isles. In complete disregard of the warnings from Germany, the US continued to load passenger ships with supplies and munitions and used them as very explosive mules - while still transporting civilians, mind you - to get supplies past the German U-boats and into Europe. Unlike what we're told in the official story, the Lusitania was NOT only carrying passengers. The truth is that the Lusitania was carrying approximately 4 million rounds of ammunition on top of other explosive supplies, below the ship's waterline. Vulnerable to torpedo attacks, this large cache of munitions is the most likely reason for the massive ship sinking so quickly (20 minutes). "It is most important to attract neutral shipping to our shores, in the hope especially of embroiling the U.S. with Germany. For our part we want the traffic - the more the better and if some of it gets into trouble, better still." So, after completely ignoring all of Germany's warnings, after using innocent civilians as shields for their supply ships, and after even hoping for a confrontation, American and British leaders feigned surprise and outrage at the sinking of the Lusitania, using the tragic loss of life to greatly increase American popular support for the war. On February 15, 1898, the USS Maine suddenly exploded while it was docked off of Havana, Cuba as a "show of force" to the crumbling Spanish Empire. The explosion killed over 260 men. The Spanish were immediately blamed for the sabotage of the Maine, and by April, were at war with the US, which claimed it was "liberating" Cuba and several other Spanish colonies (although these colonies were not allowed any part of the peace negotiations). Remember the Maine, to hell with Spain! Right? Well, not really. You see, there was no investigation whatsoever into what caused the explosion until after the Spanish American War was already over. First, people were convinced that it was triggered by a mine planted under the hull by a Spaniard. However, more recent discoveries have revealed that the most likely cause for the incident was a total accident: a spontaneous coal fire managed to spread into the ship's ammunition magazine, where all the explosives on the ship are kept. But the US had been aching for a Spanish-American war even before the Maine. A minor revolution had begun in Spanish Cuba, and US business interests were nervous that they would lose control over their sugar and tobacco interests on the island. US newspapers flooded the country with false stories of Spanish brutality and even cannabalism in Cuba just to stir anti-Spanish sentiment. After the Maine's being sent down to deter the rebels, the spontaneous explosion of the ship was just what the warhawks needed to get support for the war. The Spanish American War ended with America taking control of several other former Spanish colonies: Guam, Puerto Rico, and the Philippines (all of which had nothing to do with the USS Maine explosion, but were "liberated" anyway). And don't forget, these are only 4 examples of American wars started by lies. There are hundreds, even thousands more throughout human history. So the next time you hear that, say, Iran has nukes, take a step back and think for a second. Is the government lying to you yet again? Good article and I like the simple way you laid out. THANKS FOR THIS ARTICLE AND VIDEO...I SENT IT TO A SOLDIER.HOPEFULLY, IT WILL HELP "WAKE HIM UP"!! !